Log Jam | Patchogue Arts Council, Inc. 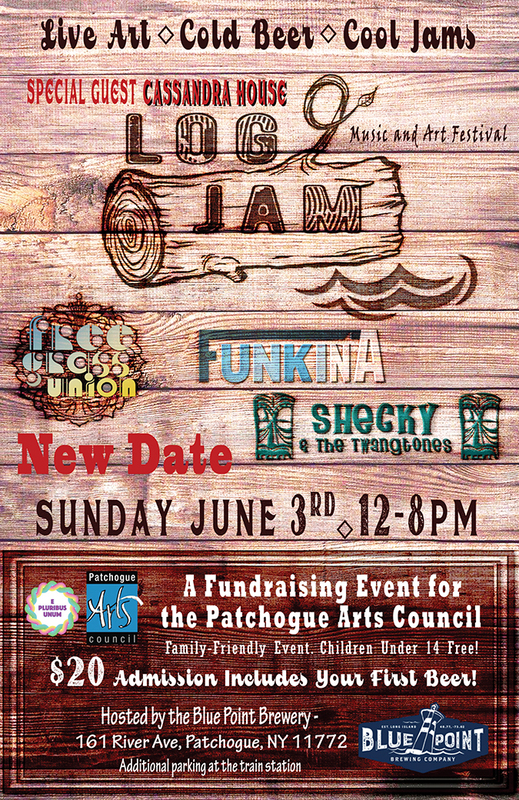 The Patchogue Arts Council, Inc. (PAC), a non-profit arts organization committed to the encouragement, support, and promotion of the arts within the greater south shore of the Town of Brookhaven is excited to kick off the summer music season with the 9th annual Log Jam! Join us for Live Art , Cold Beer, and Cool Jams at the 9th annual Log Jam Music & Art Festival. This all-day music and art festival will take place on Sunday, June 3rd at the Blue Point Brewery, 161 River Ave, Patchogue, NY 11772 from Noon-8 PM. Log Jam is a daylong music and art fundraiser for the Patchogue Arts Council featuring the best in live local music and art for all ages. This year the E Pluribus Unum (EPU) Festival Season 2018, will celebrate the concept of unity from diversity in varied media and disciplines including visual arts, dance, music, film, and video in multiple venues in downtown Patchogue from May through October. Admission for this all-day festival is $20 and will be collected at the door. Everyone over 21 will receive a ticket for a Blue Point beer. IDs will be checked at the door. This event is family-friendly, and children under 14 are free. Art stations are open for children and the young at heart. Live fine art will be made throughout the day by Log Jam artist alumni. Please come help us celebrate one of the last events to be held at the Blue Point Brewery’s River Ave location while supporting local art and music! Please bring chairs and blankets; limited seating available.